Greg Payne runs the 650-acre GSP Farms, a seed farm in the Caldwell-Middleton area of Idaho. 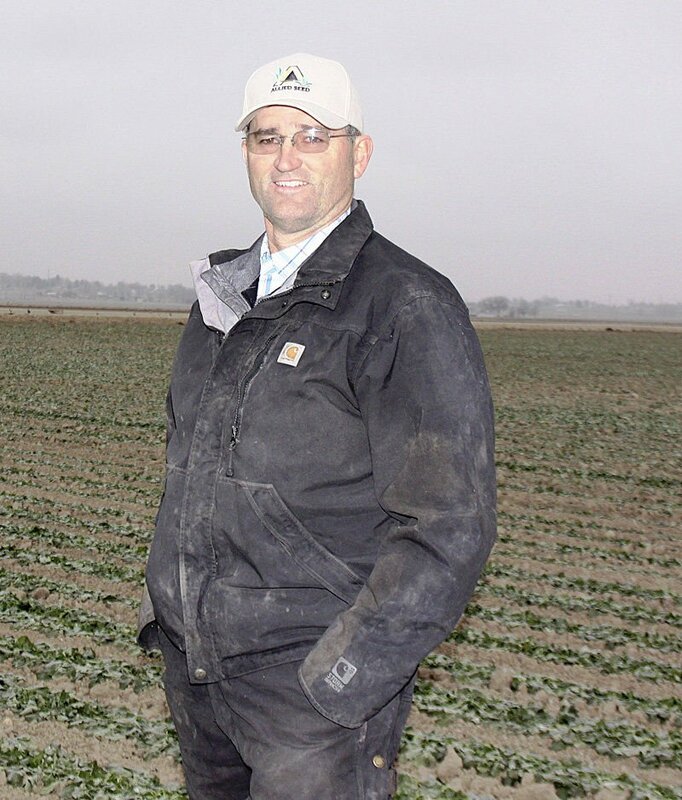 Greg Payne looks at the winter health of Purple Top Turnip seed. Greg Payne didn’t leave farming for long. He was away at college in Twin Falls, studying and training to become an Idaho State Police officer. The family started farming in the Caldwell-Middleton area around 1935. Family members operate separate entities but share equipment and some tasks. Payne runs the 650-acre GSP Farms. All crops are grown for seed production: hybrid sweet corn; different varieties of peas and beans; turnips; collards; orchard grass; and nematode-resistant radish, mustard and Pratex oats. The farm also propagates Black Mitcham peppermint rootstock that originates in a greenhouse off-site. For much of his farming career, he raised crops such as wheat, corn, potatoes, beets and pinto beans, at times fetching commodity-like prices. He started raising hybrid sweet corn seed around 1990 and subsequently transitioned to growing more seed crops as opportunities arose. GSP has been almost entirely a seed producer for the past half-dozen years or so. For example, successfully growing hybrid sweet corn seed largely hinges on when the male and female varieties are planted and when the latter is de-tasseled by hand, all of which affect pollination timing. “Hybrid sweet corn is definitely our most challenging crop to produce,” Payne said. Other challenges in producing seed crops of all types include isolation: fields should be at least a mile apart so different seeds and varieties don’t cross-pollinate, he said. What is grown at nearby farms and gardens must be considered when placing certain seed crops. Transitioning to organic production brings challenges such as controlling insects and pests without spraying synthetics, and completing the required documentation to be certified organic, Payne said. Nematode resistance can benefit organic farms where treatment options are limited because synthetic chemicals are not used, said Sherman Takatori, Idaho State Department of Agriculture pesticide training specialist. There are several nematode species, some specific to plants and others specific to plant types. “Depending on the target crop you ultimately grow, these (seed) varieties can lower the number of nematodes that will attack the crop,” Takatori said. He said it’s good agricultural practice to use cover crops in some circumstances. They have the potential to out-compete weeds and add fertility to soil, and using certain cover crops in rotation can reduce nematode risk — some radish varieties, for example, have natural nematicide properties, he said. GSP Farms, which employs seven people and adds a couple during peak season, works side-by-side with seed companies throughout growth and harvest processes. Acreage tends to be stable year to year. Payne said revenue has been down on recently lower crop prices, and he does not expect a big turnaround in the overall market this year. Payne, 48, enjoys being outdoors and working with nature, as well as “the challenge of new and different seed varieties,” he said. “On the farm, every day brings something different,” he said.